This page contains the schedule of our swim lessons, clinics, and workshops. Click an event name to read more about it. Bookmark this page and check back, as we will be updating this list of events often. 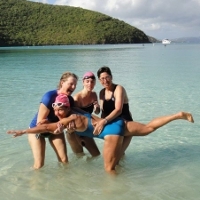 Join Celeste St. Pierre, owner of TriathlonSkills.com, for a swim class, a weekend swim clinic, open water clinics, or an ongoing class that will help you learn new skills and move your body in new ways. She offers classes and privates sessions, weekends, weekdays, and evenings (or once-a-month series) so you’re sure to find something you can work into your busy life. You’ll enjoy learning with other athletes in a non-competitive environment, working on skills that you’ll be able to apply to your own training. Through the clinics and classes, you’ll learn the basis for new skills, be videotaped so that you can see your form, and learn how to think about movements so that you get the most out of each session. Videos of my swimming really augmented my learning. I can study the way it is supposed to look and visualize this when in the water. Each session feels like a series of breakthroughs in improving my stroke. She has brought an efficiency and fluidity to my swim stroke resulting in faster times with less effort! Thank you, Celeste! I’ve been ChiRunning and cornering like a mad woman. You ladies are all amazing! The camp was absolutely amazing… incredible training and advice, incredible women. My only complaint is that Celeste is so popular with our tri club that I can’t get a lesson! Before training with Celeste, I didn’t think that the swim could be my favorite part of a tri. Celeste is a joy to work with and I can guarantee your swimming technique will be transformed! Copyright (c) 2017 TriathlonSkills.com. All Rights Reserved.